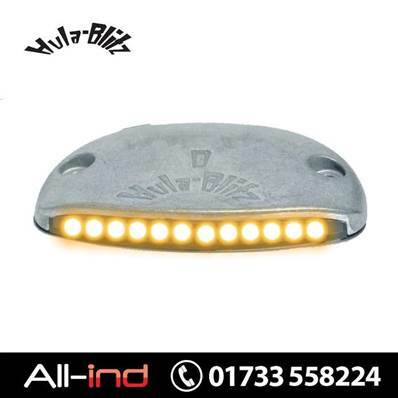 The popular tail lift warning light Hula Blitz LED version. Powered by a series of LED's to give a yellow warning light source. LED life of over 10,000 hours. Operating voltage 24V DC although a 12V DC version is available. Zinc die-cast body 16.6mm high construction. Water and dust proof encapsulated diode block. Depth is 71mm, width is 115.6mm and mounting hole centres of D33.5mm x W87mm. Note this unit is constantly lit and requires a seperate flashing relay fitted to the supply to cause the light source to blink or flash. Tail lift warning flags or lights should be used to clearly show tail lift in operation and are a requirement of Lifting Operation and Lifting Equipment Regulation (LOLER 1992).